Entanglement is one of the most puzzling features of quantum theory and a principal resource for quantum information processing. It is well known that in classical information theory, the addition of two classical information resources will not lead to any extra advantages. On the contrary, in quantum information, a spectacular phenomenon of the superadditivity of two quantum information resources emerges. It shows that quantum entanglement, which was completely absent in any of the two resources separately, emerges as a result of combining them together. We have for the first time experimental demonstration of this quantum phenomenon with two photonic three-partite nondistillable entangled states. Our work presents the first demonstration of the “something out of nothing” type super-additivity of two quantum resources. This phenomenon lies in the very heart of the quantum information. Quantum entanglement leads to the most counterintuitive effects in quantum mechanics and it plays a central role in the field of quantum information and quantum computing. The entanglement quantitative and qualitative characterization for mixed and multipartite systems is still under intense research. An important and crucial question is to know which of the mixed states can be distilled to maximally entangled states with help of local operations and classical communication. The Horodecki group (Pawel, Michal, and Ryszard) have made an important discovery by predicting theoretically existence of quantum entangled states where no entanglement can be distilled. This peculiar entanglement has been called bound entanglement. This new class of states is between separable and “free” entangled. A phenomenon of super-additivity is the most striking and remarkable feature in quantum information processing. It is feature of the super-additivity of the two quantum information resources –metaphorically speaking– ,,adding two zeros” results in ”nonzero value” or –in more precise words– the resource (specific type of free entanglement) completely absent in any of the two ingredients emerges as a result of putting the two ingredients together. 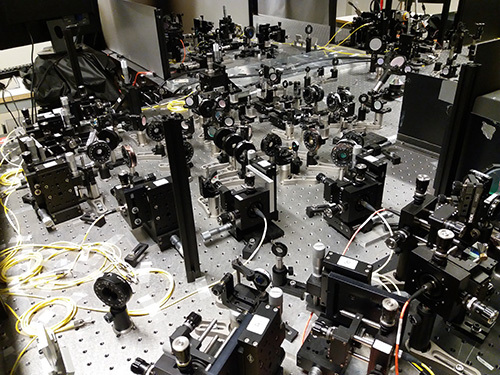 Here we report on the first experimental demonstration of a novel three photonic qubits bound entangled state and fully characterize its entanglement properties. Importantly this is the first experimental realization of a bound entangled state that can be used for generation of multipartite bound information. We have successfully produced the three-photon bound entangled state on the party A, B and C, whose entanglement is undistillable with respect to A/BC and B/AC cuts and hence bound entangled. The undistillability was confirmed by Peres-Horodecki’s test. Moreover, what is even more important, we have demonstrated the spectacular phenomena of super-additivity of two quantum information resources. Our experiment is also the first realization of the activation protocol of bound entanglement. We have activated the bound entangled state with the help of the free entangled distillable state on the party A and B, and finally produced free entanglement between B and C. Since the entanglement of each resource by itself is undistillable between B and C.